What Is Metal Casting /Foundry? What Are Its Application Advantages And Limitation? 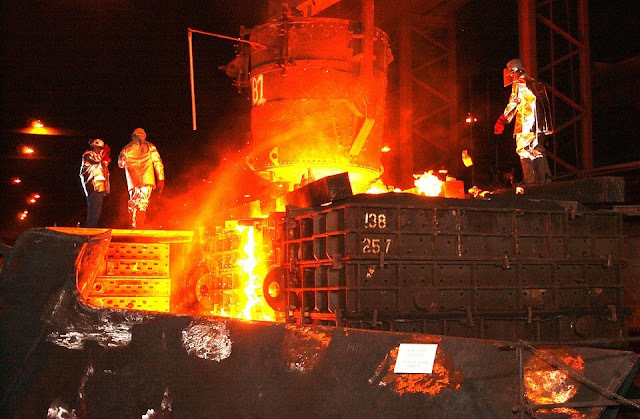 Casting is the most extensively used primary manufacturing process, in which liquid metal (molten) is poured into a mold with a cavity of shape to be made, and allowing it to solidify. When the metal solidifies, the metal object (known as casting) is taken out from the mold either by breaking the mold or by splitting mold apart. Molds are usually made of refractory material. The common application of casting includes the manufacturing of wheels, lathe bead, machine tools, cylinder blocks, pistons, etc. Because of metallurgical consideration, some metal and alloys processed only by casting. Casting is also known as a founding process. The casting process is popular in manufacturing due to following advantages when compared with another manufacturing process of forging, rolling, welding, etc. The most versatile manufacturing process. It fulfills the majority of requirement. Suitable for both small quantity production as well as mass production. The size and weight of product are normally without bounds, heavy product (even up to hundreds of tons) can be made by casting. It is possible to cast almost all metal; there is no restriction on the type of metal. Casting is the ideal method for trial production or prototyping. The casting process is simple and inexpensive. Normally the molds are cheap. The material use and then the weight of the product can be reduced. This process can achieve much dimensional accuracy. Sometimes subsequent finishing process need not be performed on casted product. The molten metal can flow into very small sections that help cast intricate internal and external shapes with ease. No directional properties - since the molten metal is cooled uniformly. Casting eliminates the metal joining process to some extent. Need a secondary finishing process. Normally the dimensional accuracy and surface finish achieved will not adequate for the final application. Casting defects are unavoidable for certain material. Time-consuming – the execution casting after the receiving of the drawing may take months, depending on the size, quantity, intricacy. The scope of full automation is low. Casting is still a labor intensive process when compared to another process. Hence the productivity is low. Thanks for sharing the information! Metal casting is widely implemented as it is one of the primary manufacturing technique involved in the production of many other final products.